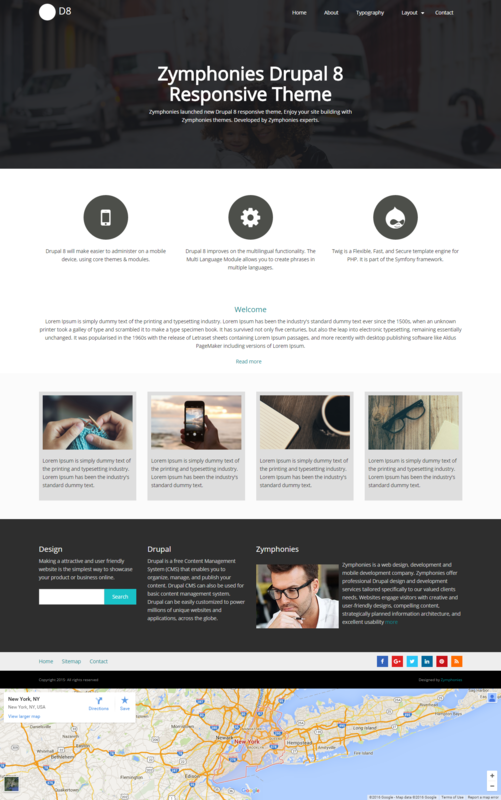 Drupal8 Zymphonies Theme is the first Zymphonies Drupal 8 Free Responsive Theme which has many new features. This theme is completely free and contributed by Zymphonies team. Top three flexible blocks: Block width will change automatically based on assigned block, Block share equal width based on assigned block. (Example, If you have only two blocks in top area block, Block share 50% each block, If you assign three it come 33.3% each). Footer four flexible block: Block share equal width based on assigned block. Bottom three flexible block: Maximum three column block, First & Second bottom block share total 50% rest 50% for bottom third block. Main static banner with custom title and description. One, two and three column layout pages. Multi-level responsive Drupal 8 menus. Bootstrap 3 framework and Font awesome icons. Option to edit copyright content from theme settings page. Option to show/hide Zymphonies credit link, We recommend to display our credit link in your website. Social media links (Facebook, Twitter, Google Plus, LinkedIn and Pinterest) - Option to add required social media links and hide entire social media links. Click here to read 'Drupal8 Zymphonies Theme' installation tutorial.